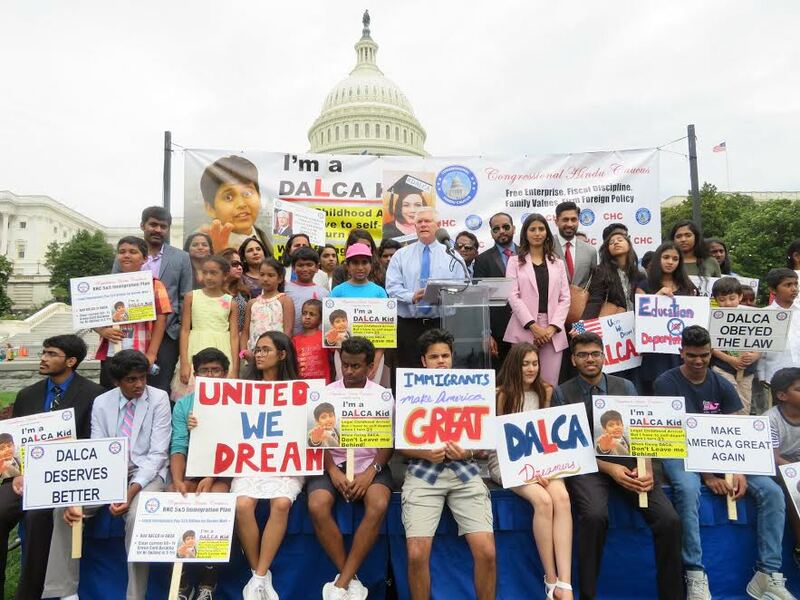 In this June 2018 file photo, Republican Congressman Pete Sessions of Texas (at the podium) is flanked by DALCA kids, children of legal immigrants from India, at an immigration rally organized by the Republican Hindu Coalition (RHC) on Capitol Hill. The proposed bill to support Dreamers does not include legal immigrant Dreamers, many of whom are Indians raised in the US but will be forced to deport. Twenty-three-year-old DK (full name withheld on request) came to the United States from India when he was nine, along with his parents. His parents live and work in the US in specialty professions on a E2 visa. However, since the E2 visa category does not offer a path to citizenship, DK, who is currently studying in the final semester of his pharmacy degree, would be forced to leave the country and return to India once he graduates. This is despite the fact that he grew up in the US, has his entire family here and knows no other home than America. DK is not alone; he is amongst thousands of children of long-term visa holders in the United States, who would no longer be considered for Green Card, due to aging out. What makes matters particularly distressing for thousands of such students in America is that while the new proposed “American Dream and Promise Act,” which provides protection to the so-called Dreamers, or DACA students, it specifically leaves the legal dreamers out of this provision. DACA, or “Deferred Action for Childhood Arrivals,” is a policy put in place by the Obama administration that allows children of undocumented immigrants who were brought to the United States while they were minors protection from deportation. The American Dream and Promise Act, introduced in the House last month, is currently before the chamber’s Judiciary Committee and the Committee on Education and Labor. The current bill to help over two million Dreamers leaves out thousands of children that were brought to the country under legal non-immigrant visas in categories such as E, H or L.
Chavan adds, “H-1B visa holders, or the nonimmigrant aliens, are eligible to apply for Green Card. Their children are considered co-applicants for permanent residency, if they are unmarried and younger than 21 the time the application is filed. But H-1B visa holders can spend decades waiting for a green card in backlog. As the backlog of applications grows, H4 visa kids, who arrived during their childhood in the United States [and spent] the majority of their lives here ‘age out’ of their H4 status at age 21. Last month, a petition was launched to engage more such students and create awareness about the plight of aging out children in America. The petition on Change.org, called “Improve the Dream Act,” was started by a legal Dreamer anonymously. The petition calls that all future Dream Acts and legislation addressing DACA should remove the requirement that applicants be undocumented.